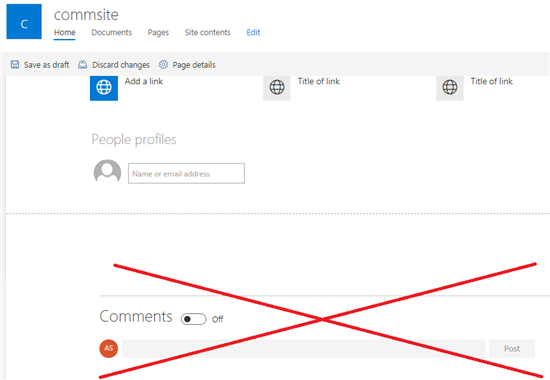 In SharePoint modern pages you have an option to enable or disable comments when editing a page. If you want to disable comments on a new Site Page, you have to publish the Page first and then Edit it again for the Comments section and button to appear. Starting from CSOM package 16.1.6518.1200 you can disable or enable comments on ALL pages in a site collection using Powershell. The property is called CommentsOnSitePagesDisabled and the setting will work on each page right from the start. The CommentsOnSitePagesDisabled also gives the administrator more control over users' editions. If the property is set to $true, the users with Member Group privileges will not see the option to turn the comments off or on. If you haven't used them yet, use NuGet Gallery to download the latest SharePoint Client Object Model libraries. # Paths to SDK. Please verify location on your computer. When the CommentsOnSitePagesDisabled property is set to $true, users with editor rights will not see the comments section at all when editing the page. The setting applies to all pages on a given site, the old and the ones created in the future.